Emre Can and Jurgen Klopp. 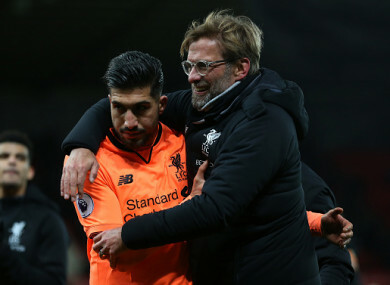 JURGEN KLOPP HAD his tongue firmly in his cheek when he suggested that Emre Can had demanded more than the reported £200,000 a week to remain a Liverpool player. The Germany midfielder is out of contract at Anfield at the end of the season, and Can’s future has been a subject of debate for much of the campaign. Earlier this week, Can hit out at “false stories” regarding his rumoured wage demands, and Reds boss Klopp was in a jokey mood when addressing the issue at a media conference previewing Liverpool’s Premier League clash with Crystal Palace on Saturday. “Yeah, it was £250,000!” Klopp said to laughter among the assembled journalists. Klopp then offered a more serious response, saying Liverpool remained in talks but that no renewal has been signed. “The situation is open, which is what we said before, as long as nothing is decided it’s open,” he added. The trip to Selhurst Park represents Klopp’s 100th Premier League game in charge of Liverpool and the former Borussia Dortmund boss described England’s top flight as the toughest challenge in football management. “Yes [it is the toughest league], I was not in no doubt about that before,” he added. “The other leagues are strong but not where six teams can win the league. In England the last three years we had three different champions [assuming Manchester City win the title]. “The quality of the other teams who are not champions is really big as well, it’s a tough place absolutely. Email “Klopp jokes about Can's Liverpool demands but insists contract talks remain 'open'”. Feedback on “Klopp jokes about Can's Liverpool demands but insists contract talks remain 'open'”.